Summer music. It becomes the sound track of memories that last all year. Join the Cheboygan Area Chamber of Commerce Thursday nights beginning June 28, for the 2018 Summer Concert Series. Each show begins at 7:00 pm in Washington Park. Bring your kids, grandkids, a picnic, lawn chairs, blankets and dancing shoes every Thursday night from June 28 through August 30. Each week is something different and there should be something for everyone throughout the summer season. We start on 28th of June with local favorite Billy Jewell playing Acoustic Country Variety. This is also the kickoff of the 2018 Waterways Festival with a children’s movie being shown on a big screen in the park once it gets dark. The next day is Kids Day for the Waterways Festival and Washington Park will be jumping with kids activities throughout the day. For all the details about the rest of Waterways Festival be sure to go to www.waterwaysfestival.com . After all the activities of the Waterways Festival and the celebration of the 4th of July, Evan Archambo takes over Washington Park for the July 5th offering of the Summer Concert Series. He is another local talent who has a great skill with acoustic guitar and a voice to match. July continues with the Charlie Millard Band on the 12th with their eclectic mix of roots rock, jazz and blues. Charlie Reager plays his brand of acoustic variety on the evening of Thursday July 19. The month closes out with a visit from some of our neighbors from the west side of the state. Petoskey Steel Drum Band is always a crowd favorite with their high energy steel drums. This performance is brought to us in part through a sponsorship by Citizens National Bank. The August schedule kicks off with a new visitor to the Cheboygan area. Charlie Don’t Surf which plays 90’s alternative rock will open the month on the 2nd followed by Ron Getz & Friends on the 9th. Ron is known as Northern Michigan’s premier jazz guitarist. On the 16th of August Dale Reiger & Friends perform as part of the series with a great blend of acoustic oldies and modern favorites. On the 23rd, the Darwin Project takes over with a blend of originals songs and rock from the 60’s to today. They are brought to us by Calcite Credit Union. The season comes to conclusion on the 30th with Heavens ta’ Betsy, playing a variety of classic rock favorites that everyone is sure to recognize. 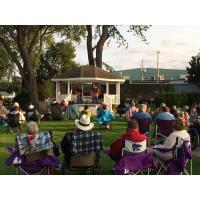 Summer music in Cheboygan. Every Thursday starting June 28th at 7pm in Washington Park. Come make it a part of your summer sound track. To help sponsor one of these evenings or for all the latest details and information on the scheduled performers visit www.Cheboygan.com , or call 231-627-7183.